Have you ever thought that financial losses of Android developers, small and huge ones, are estimated in billions of dollars? Creating a great content and making it wide public sometimes is not enough to make the product profitable. What are those developers and publishers are missing? 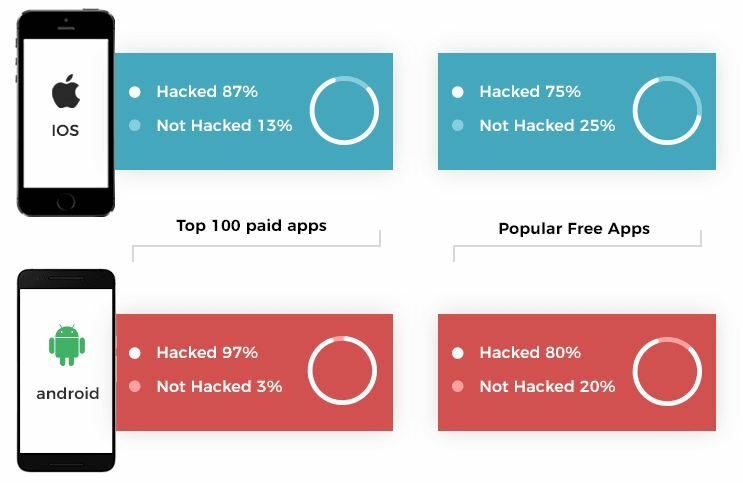 Here is some interesting info: According to Arxan Technologies, over 90% of iOS apps from “Top 100 paid apps” rating were hacked, meanwhile on Android there were 100% of hacked apps. 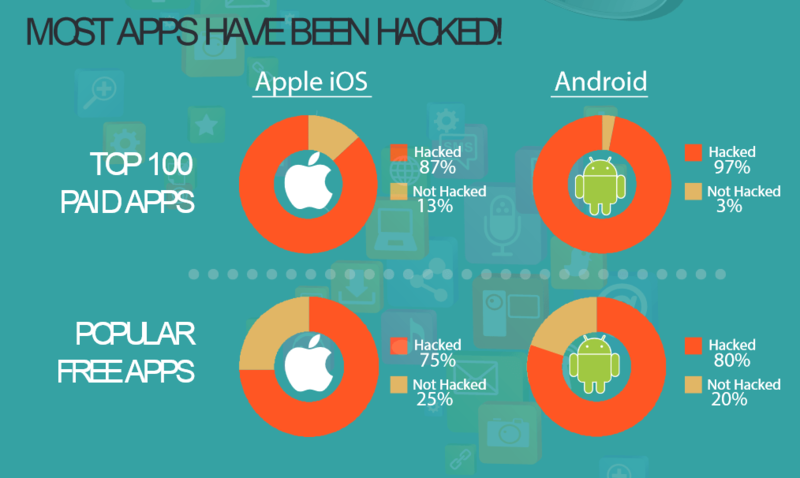 Free apps were also affected: for iOS there were 40% of hacked apps, for Android – 80%. As you can see, hackers don’t really have any specific preferences and hack all kinds of apps: games, books and business utilities. That’s why the main goal of all developers should be not only making a great app, but having the ability to protect it from being stolen. According to F-secure: the company discovered over 51000 kinds of malware software for Android. In Google Play they discovered only 146 viruses out of 28398 malware samples. ● Appinventiv: Android vs iOS: Which Platform is More Secure in (2018) According to the latest Appinventiv data, things got better, but insignificantly. That’s why the problem of hacked and stolen software always was and won’t go anywhere in the nearest future. Addvertize is aimed at solving all those protection and monetization issues for Android developers. We believe that mobile monetization is evolving slowly. The only real solution for most of publishers is in-app ads. And even this solution has a lot of ifs and buts – one major corporation dictates the rules how to do ads and when. Of course, they have the right to do it, but it doesn’t make the life of publishers easier, right? Only very few AAA players get something decent from advertising. Ad revenues are highly dependent on app usage time and user retention. The more users utilize an app-the more ads appear, the more irritated users get and, finally, the lower rating they give in Google Play, dragging an app down the charts and killing all the traffic. Vicious circle! According to Businessofapps.com, only official 3rd party app stores generate 50% of total revenue! Plus, hundreds of unofficial sources. Why not to monetize them better? Right now we are left with Interstitials, Videos and Banners, only in very specific places, and the list of those places gets shorter and shorter. Yes, Native ads is something relatively new, but it needs a skillful customization for each separate app. So, what next? Some super-new life-saving ad format or revolutionary monetization strategy? Many of apps and games on the market are actually masterpieces and deserve their place in the history and their developers – a reward. But, unfortunately, researches show that 80-90% of those apps get stolen, hacked, cracked, injected with 3rd party ads, crypto miners, malware, adware and who knows what else. This is a huge problem. Obfuscation tools might be a solution, but they are pricy and complicated. To keep this wobbly balance between tolerable user experience and decent ad revenues for publishers, we invented a smart trigger-based system, which serves additional ads without compromising app rating on Google Play and abusing users. Moreover, it protects apps from injections and other nasty things, as well as prevents its own SDK from being removed, granting a significant additional traffic and money income. Basically, it’s an advertising swiss army knife and bulletproof vest from any external factors. – APK protection from injections or any other interference: your app will be safe from adware, malware, trojans, miners e.t.c. ● Hence the name, additional monetization is our focus – no need in changing your monetizing strategy. Generate additional advertising revenue stream only when, where and how you want it. You don’t even need anything but your APK file to get started – as simple as it is. ● APK protection from any interference or modification. You can be sure that no one will inject their adware/malware/miners/etc. modules. ● One SDK and APK for all traffic sources. With our help you won’t be losing traffic anymore and you will be able to monetize 100% of your traffic both from Google Play and any other sources. ● Remote control over ads. Another part of our system – you don’t have to upload your apps again and again in order to change your ads pattern. Everything is controlled remotely in just one click. Since we are using trigger-based ads, there is no need to customize apps manually-e.g. between game levels, that’s why SDK integration in Addvertize happens in one click. Normally the integration process itself takes around 1-2 minutes. That’s not to say about a sophisticated app protection and SDK non-removal features, which would be simply technically impossible for many developers, even if they wanted to implement them manually. Then you should hit «Add» button, choose your APK file, wait for the file to be uploaded and then hit «Next» button. With sliders on the left side you set the frequency of ad impressions, sliders on the right – overall daily limits of impressions. The frequency of each parameter can be changed anytime (and also remotely). Then you hit the “Next” button and go to the part where you add your keystore to your APK file. You can skip this step, in that case we will generate our keystore automatically. IMPORTANT: We securely encrypt your keystores with SHA standard and your keystore passwords are discarded right after the integration process is complete. Don’t forget that if you are very much concerned about giving away your keystores to 3rd parties, you can sign your app with our random key, just leaving the keystore field empty, and then re-sign it locally with your own key. Finally, you hit “Integrate” button and the process starts. Normally it takes 1-2 minutes. When the integration is done, your app gets “Built” status and you can download it hitting Action button, which looks like blue cloud. If you keep all those rules, the integration shouldn’t be an issue. Addvertize is complex solution targeted mainly for Google Play app developers and publishers, but also for 3rd party appstore publishers, traffic brokerage professionals and other specialists from various mobile niches and verticals. What is rather typical is that at some point Android app developer moves outside Google Play app store. And often that happens against developer’s will. Unfair copying, hacking, cracking, injecting all kinds of malware or simply removing developers’ legit ads – all this leads to severe traffic loss. But now, with Addvertize, you can be sure that your app is totally secure and that 100% of the traffic will be counted on you and monetized properly and legally. Summarizing everything said: we hope that this small tutorial and project description helped you to understand it better and that now you have a clear picture when and how the project can be useful for you specifically. Sign up and check everything yourself. We are sure that you will be surprised with the numbers of additional installs and traffic that otherwise would have been stolen by some malevolent characters.